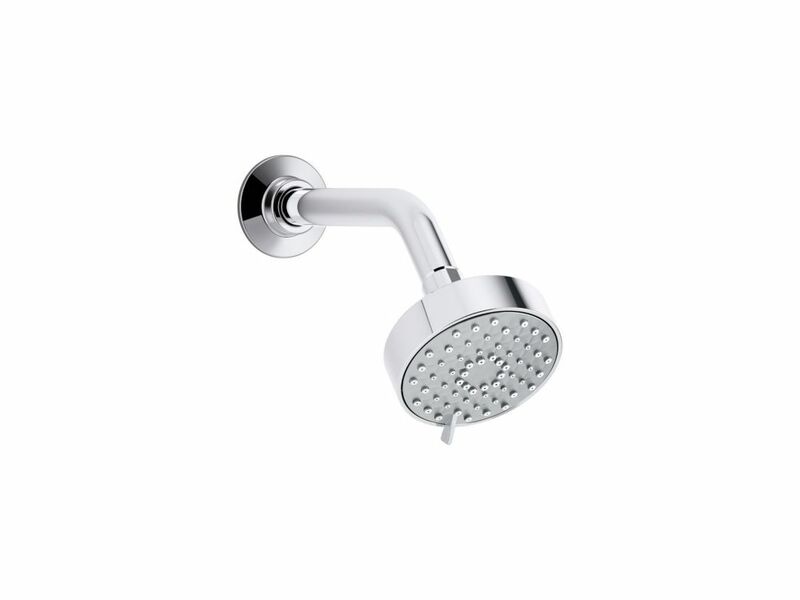 Awaken G-Series showerhead features a contemporary design. Restore your spirits with the calming effects of a gentle rainfall. American Standard's Rain Showerheads complement the look of any bathroom and give you a softer, milder shower experience. Modern style, with a graceful and stunning design. Also available in store by special order only see store for details. This Alteo single-function showerhead brings innovation to your bathroom with Katalyst, a cutting-edge technology that intensifies the flow of water for a completely indulgent showering experience. With a new nozzle pattern, internal waterway design, and air-induction system, this technology maximizes every water drop and creates a richer, more intense flow of water that heightens the shower's sensory experience. By infusing two liters of air per minute, Katalyst delivers a powerful, voluptuous spray that clings to the body with larger, fuller water drops. This Devonshire single-function showerhead brings innovation to your bathroom with Katalyst, a cutting-edge technology that intensifies the flow of water for a completely indulgent showering experience. With a new nozzle pattern, internal waterway design, and air-induction system, this technology maximizes every water drop and creates a richer, more intense flow of water that heightens the shower's sensory experience. By infusing two litres of air per minute, Katalyst delivers a powerful, voluptuous spray that clings to the body with larger, fuller water drops. Awaken 3-Spray Showerhead In Polished Chrome The Awaken showerhead brings KOHLER quality, design, and performance to your bath. Advanced spray performance delivers three distinct sprays - wide coverage, intense drenching, or targeted - while an ergonomically designed thumb tab smoothly transitions between sprays with a quick touch. The artfully sculpted sprayface reveals simple, architectural forms that complement contemporary and minimalist baths. Awaken 3-Spray Showerhead In Polished Chrome is rated 4.5 out of 5 by 2. Rated 4 out of 5 by HomeDepotCustomer from It does what is expected to do. My review is... It does what is expected to do. My review is based on current performance. Rated 5 out of 5 by dea4 from We wanted to replace our 17 year old shower head so we purchased one in our local home improveme... We wanted to replace our 17 year old shower head so we purchased one in our local home improvement store, 7 functions and not one good shower spray in any of them, the only good spray was the massage one. So back to hunting for a shower head. Purchased another that cost twice as much as this one and was huge. it got great reviews so I gave it a try, it was not worth the money at all. Then I found this, it has the 3 main sprays I like, a nice softer shower spray, a little harder spray and then a massage spray that is not pulsating (which I cannot stand). The softer spray comes out of EVERY hole and there is no huge gap in the center (like the 1st one I tried). The little harder spray is great for rinsing your hair and the massage spray is wonderful as well. This has great pressure even though it is 2.0 gpm. I have found my shower head, this one is great. The only drawback is that it is made of plastic, but most are unless they cost a lot more, but it looks very nice . So for what this costs, it is a great shower head.